RIO DE JANEIRO, BRAZIL — Although the Brazilian government has been reducing forced labor in the country since 1995, extreme exploitation of workers still exists and has become more concentrated in urban areas, with 1,068 people freed from slave-like working conditions in the country’s cities last year. A new series of independently produced documentaries seeks to cast light on this issue and record the experiences of those who find themselves in this situation. It is estimated that as many as 200,000 people could be working under slave-like conditions in São Paulo, photo courtesy of Notibras. Makeshift Americas is a film project initiated by Ana Defillo, an M.S. Candidate in Global Affairs at New York University, who is writing her theses on forced labor and has decided to employ her previous experience in filmmaking to raise awareness of the issue to a wider audience. The first of Defillo’s films is due for completion in September and focuses on the garment industry in São Paulo, where, according to a statement from a state investigatory committee, there are about 10,000 illegal sewing workshops in the metropolis alone, involving 200,000 workers, many of them immigrants from Bolivia. 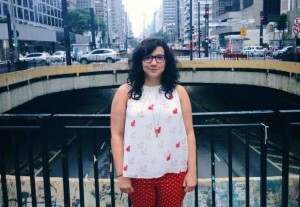 Ana Maria Defillo is one of the documentary filmmakers behind Makeshift Americas based in São Paulo, photo internet recreation. Having been to film school for her undergraduate studies and collaborated with friends previously, Defillo says that this is the first film project that she is proud of and that she has aimed to present the same information in a more measured way than has previously been seen. “Many times when this issue is addressed through the media it’s heavily exploitative and reductive. We are trying to do the opposite of that and hopefully we have succeeded. The main goal of this project is to present this topic in an unsensational and research heavy manner.